Donned a frock on Saturday night and hosted the San Francisco Boys' Chorus Gala at the Ritz-Carlton in San Francisco. Didn't have anything near the wardrobe of Anne Hathaway at the Oscar's ceremony on Sunday, but I had fun anyway. I wish I had been asked to curate the performances for the evening though. All of the soloists and groups on the schedule were wonderful in their own way, but some were more appropriate to the proceedings than others. For instance, I love the Conspiracy of Beards (an all-men's chorus dedicated to performing a cappella arrangements of songs by Leonard Cohen). But I query the sense of putting them before a crowd of donors and parents who are obsessed with developing a high level of musicality in their children. The Beards, a shambling community chorus, are emblematic of non-punctiliousness in choral music, which is partly why they're so much fun to watch. They sing with incredible gusto and have a lot of style about them -- but their intonation and phrasing can be a bit rough. Hence, giving this group the final 'headliner' slot at a gala aimed at raising money to help boys aspire to musical perfection was a bad idea. Plus, the ensemble's dirge-like renditions of Cohen's downbeat songs hardly inspired things to end on a high. The pianist Jenny Lin made her recital debut on Sunday afternoon at the San Francisco Conservatory of Music under the auspices of SF Performances. 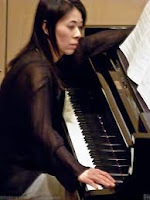 The program was imaginative: Lin juxtaposed Preludes and Fugues by two composers, Shotakovich and J S Bach, in five sets, each comprising of three works. What was clear from the music was how similar the two composers' approaches are. Sometimes, it was difficult to hear quite where Bach's music ended and Shotakovich's began and visa versa. What I missed from Lin's otherwise engaging performance, was a sense of the differences between the composers' mode of expression. Lin brought the same style of attack -- clean, clear and often quite hard -- to all the pieces in the program. But the playing of Shostakovich requires a different kind of touch at times to the playing of Bach. I would have liked to have heard the contrasts between the masters more strongly. Spent Sunday evening with some friends in front of the Academy Awards. It's been a few years since I've sat through the whole thing from the opening red carpet parade to the final credits. I don't think I'll do this again anytime soon as my brain had turned to custard by about halfway through. There were no surprises. With the exception of Colin Firth's witty and sweet acceptance speech for the Best Lead Actor award, the winners' words of gratitude were dull beyond belief. Biggest disappointment of all: James Franco looked terribly embarrassed in his role as co-emcee with Anne Hathaway. I don't buy the excuse that Franco was too busy working on his phD to spend time rehearsing for the ceremony. If you're going to take on a gig like this, you should throw yourself into it, no matter how dumb the task at hand might be. While Anne Hathaway made the best of the cheesy situation, Franco gave off the vibe that he'd rather be anywhere else but the Kodak Theatre. I suffered with him. It was too bad. P.S. I lunched with Michael Tilson Thomas for the first time on Friday. The SF Symphony's music director came bounding over and the first thing he did was sing me an old Vaudeville song called "Chloe." He started with a gleeful rising refrain that went "yup yup yup yup yup" and then sang my name in much the same style as Al Jolson belts out the word "Mammy." Apparently the stage was bathed in green light every time the Chloe song was sung back in the day. It became so popular that the band would only need to strike up the "yup yup yup yup yup" sequence and the audience would know to belt out "Chlo-eeee" in response. Here's a link to Spike Jones' version of the ditty on YouTube. It's nice to be associated with a song. But I fear that I may never live this down. When I connected with MTT on the phone today for a chat about a story I'm working on for this Friday's New York Times, the maestro greeted me with a gleeful giggle and "yup yup yup yup yup."